We drove in a marvelous pre Andes environment. 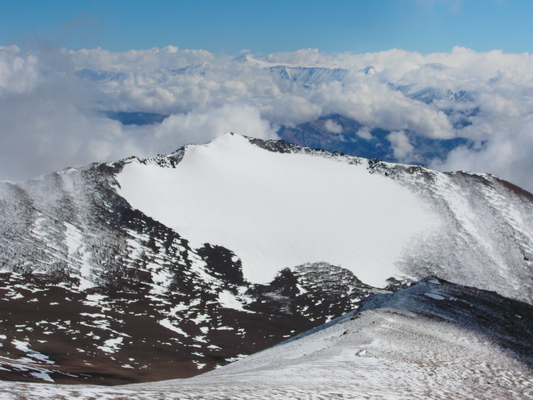 Pre Andes means that the mountains are already higher than 4000 meters - comparable to the tallest summits of the Alps and Rocky Mountains! In Barreal we stayad at the camping municipal (GPS coordinates: S31° 39.811' W69° 28.065'). We asked Mauro from Don Lisandro (www.donlisandro.com.ar) to drive us with his 4 wheel car to the Refugio Laguna Blanca. At the premises of Don Lisandro we could park our car safely. We started our Mercedario adventure on Thursday, February 10th 2011 at 9:00AM. The track to the Refugio Laguna Blanca is very dirty and rough. It has been built by mining companies. There are still a lot of mining activities (mainly copper), so you have to pass a security and registration check. 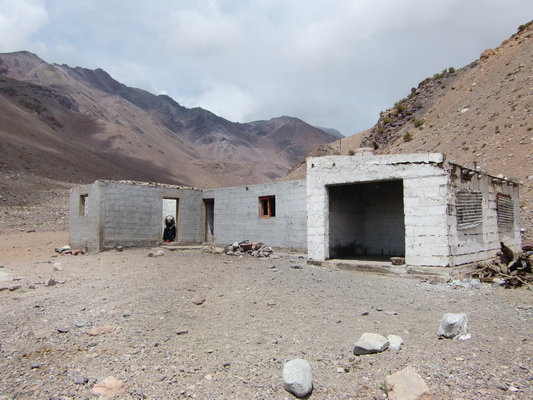 We arrived at 2:00PM the Refugio Laguna Blanca and it is not a very pleasant house: More or less ruins! Besides that it started raining (GPS coordinates: S31° 54.226' W70° 00.129'). Consequently we checked if there was a possibility to stay the night. We found one room with 99% covering roof. With us were tree Argentine men: Oscar, Mario and Geraldo. Oscar looks very young for his 64 years; he has 10 children and a lot of grand children. They took the "garage" like room on the right side of the building (see picture above). They were very happy seeing us. We got some of their afternoon meal, rice with meat. It tasted wonderful, but the best was the desert: peaches! Thanks a lot Oscar, Mario and Geraldo. Fortunately it stopped raining some hours later and we decided to carry some equipment to the base camp Guanaquitos, which is just two hours walk away. The way is always relatively clear and logic: Only at the Guanaquitos camp you have to follow the middle of the three valleys (not the old mining street!). It turned out that Marcos Ceballos is one son of Oscar. 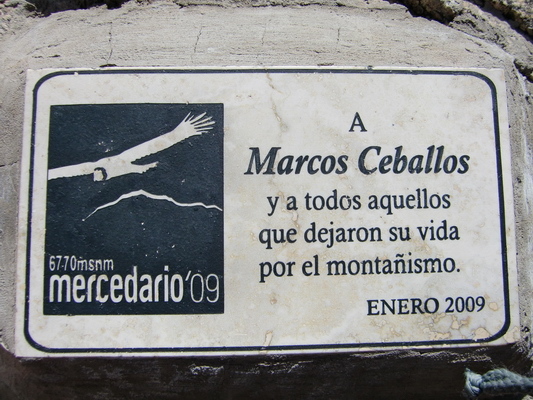 He died 2002 in the south face of Mercedario. The South face is the most difficult route on Mercedario with a lot of ice climbing, comparable to the South face of Aconcagua. Keep in mind that in the Southern hemisphere South face is analogous to North faces in Europe and North America. The second day in this camp we met Franc from California the first time. 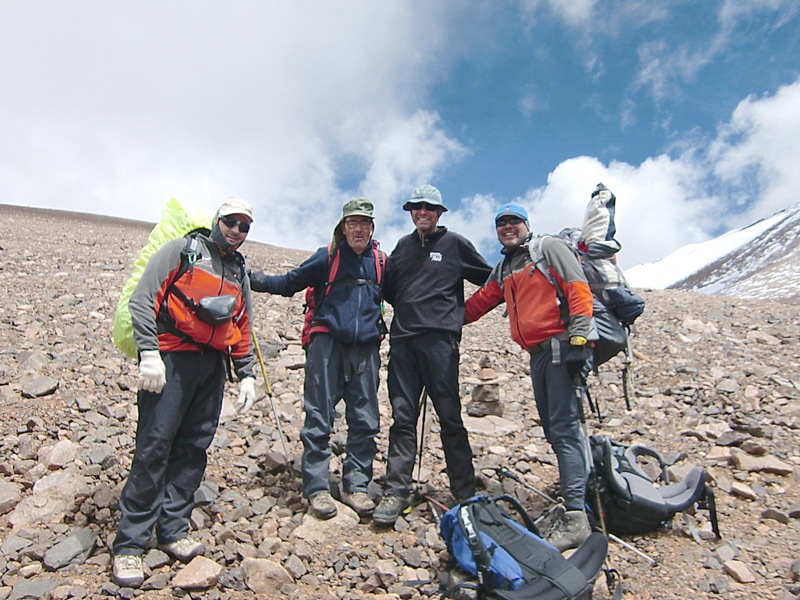 He is also in the grandfather age, but he wanted to climb up Mercedario, at least to achieve an altitude above 20000 feet (approx. 6100 meters). So we were in total 6 people (five men and one Lady, Marion) on the way to Mercedario. In addition a lot of people came down the mountain, some frustrated because nobody achieved the summit due to the bad weather. 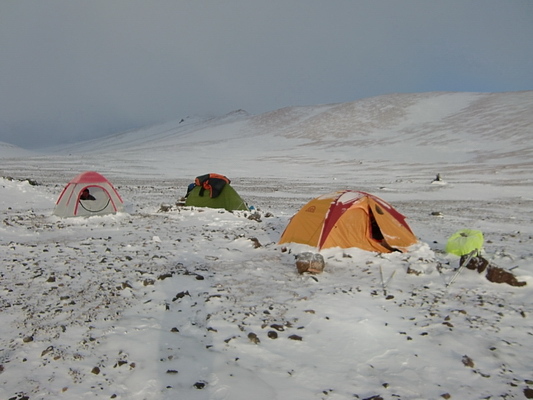 Some were laying several days in the tent like the herrings due to heavy snow fall and storms. We saw five German men, many Argentine men and two Ladies (Marianne and Helga) from Austria returning from the mountain. 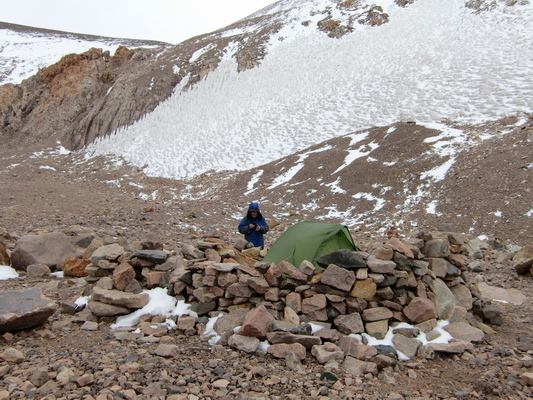 We met Marianne again on our first trip to the advanced base camp Cuesta Blanca, because she had to fetch her tent there. She was much faster than us because we had to carry a lot of stuff. When we returned to our tent at Guanaquitos we found a new plastic bag in our tent, which contained a lot of delicious soups and sweets from Austria. We deeply enjoyed this additional food, which is very different of the Argentine ones we had. Thank you so much Marianne and Helga. 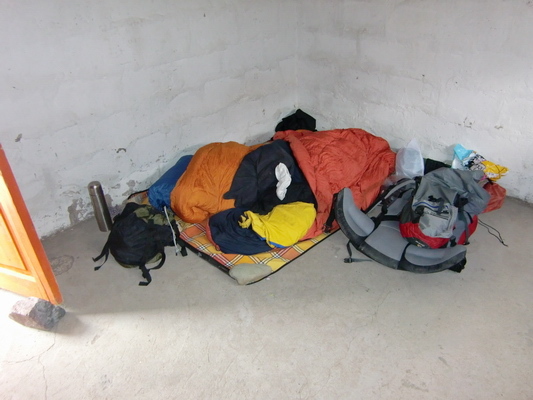 The weather in the advanced base camp Cuesta Blanca became weird when we moved to it. Cuesta Blanca means white slopes; it is surrounded by steep slopes with significant penitentes. Pentitentes are snow needles, which can be several meters high. Good luck if you have to deal with them, then you are really penitent! Fortunately the path to the next camp avoided all penitentes. 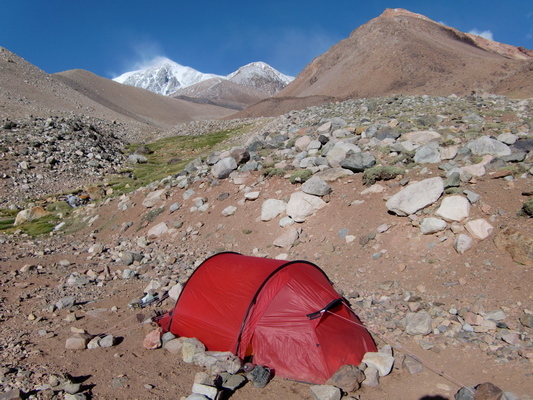 In the first night some wind came up and our tent fluttered a lot. Suddenly we heard some very strange noise like the roar of a Puma. 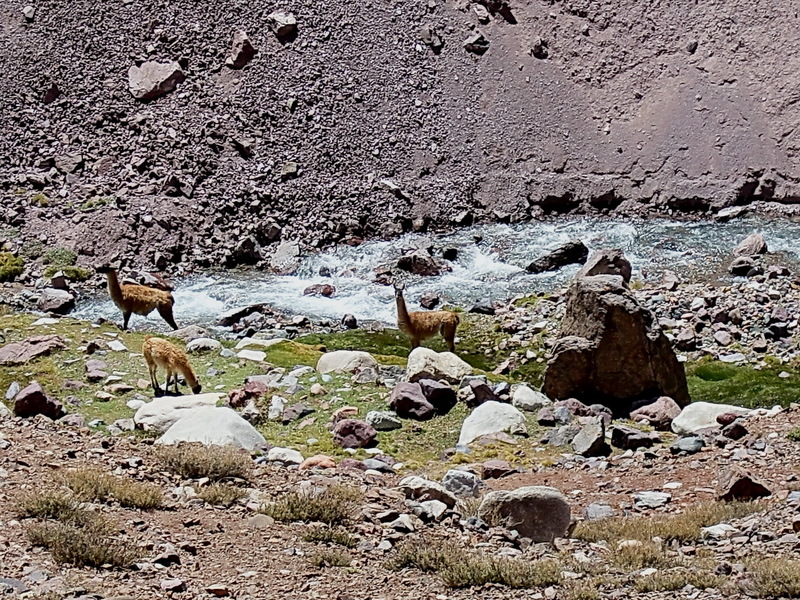 There are some Pumas in this area, thanks to many Guanacos. It stopped approximately after 90 minutes. On the next morning we discussed this topic with our Argentine friends. They started laughing heavily, because Oscar took his small radio to the mountain. It had been Saturday evening - football time. Mendoza was playing against San Juan. One of Oscar's son plays for Mendoza and another one for San Juan. San Juan, the much smaller city, beat Mendoza by 4:0. And Oscar's son shot one goal. So Oscar created the weird noise in his buoyant spirits! 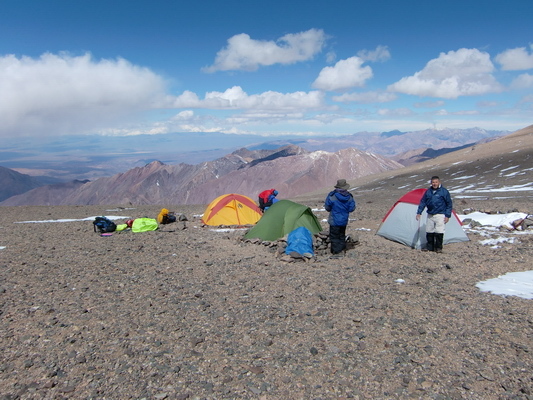 In the morning on the second day the weather was beautiful; so we moved to the first high camp Pirca del Indios. There should be some artificial walls built by the Incas, but it was not possible for us to distinguish which walls are the archaeological ones. There were many stone walls to protect the tents from the wind! Definitely this is a very windy corner. The storm was so noisy the first night that we were hardly able to sleep. It was like lying near a huge steaming machine, a very deep and loud roaring sound interrupted sometimes for few seconds by silence. But it came back with even more force. We were happy that the storm declined a little bit on the next day and night. So we could move slowly to the 2nd high camp. We walked very, very slowly, because in addition to the sleepless night we felt the altitude intensively. 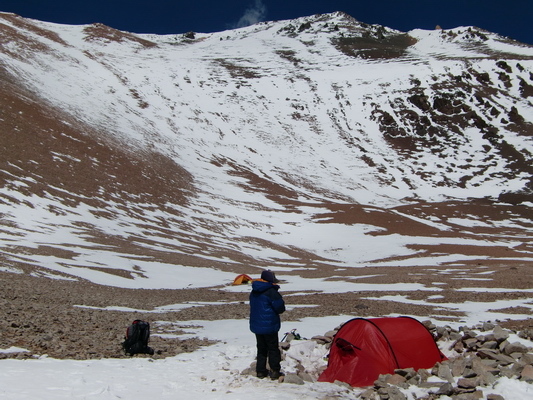 In the early evening we realized that we forgot the bag with our food in the 1st high camp Pirca del Indios. Marion thought Alfred took it and vice versa. We checked our backpacks and found three muesli bars and one small bag of nuts. Not very much for two days! Marion searched around the camp and found some sherbet powder. At least we had a little bit of sugar and something to sweet our drinks. Finally we asked Franc if he has a spare soup. He had plenty and he was happy to give us two noodle soups. They tasted wonderful - thanks a lot Franc. We are not sure if we were able to reach the summit without you! Friday, February 18th 2011: Wonderful weather without severe wind - summit day! We started at 4:00AM in the night and hiked slowly, very slowly up. Unfortunately our Argentine friends were even slower, so we were alone. When the sun came at a height of approximately 6255 meters we had to use our crampons and ice axes. We had to cross some slopes with a lot of snow in it. Sometimes the snow was groundless deep, but often it was hard like ice. No way without crampons because if you fall you slip down extremely fast! Finally we achieved the ridge - still no significant wind. We were very lucky, because Mercedario is famous for its tremendous fierce storms. But there were 7 (seven!) false summits on the way to the highest point - it is like a never ending story. But we arrived at the top around 1:00PM. Nine hours for 1100 vertical meters is a lot, in the Alps you calculate less than 4 hours for such a distance. But the extreme thin air paid its price; you have to step slowly, slowly, slowly and force yourself not to stop! Alas it became cloudy exactly in the moment we achieved the summit. But it was acceptable warm and still no wind, so we stayed almost one hour there and we could rest a little bit. We were so happy! Unfortunately our Argentine friends did not come to the top. 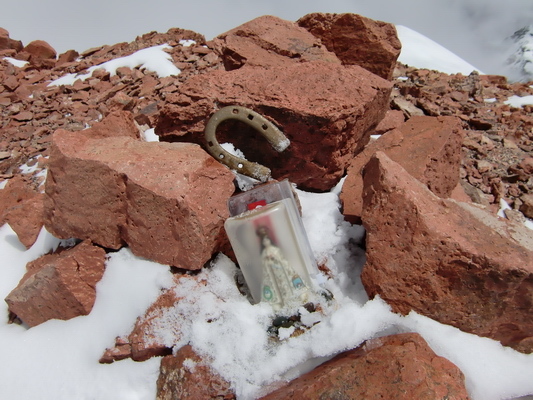 We didn't expect Franc on the summit, because he had no crampons. 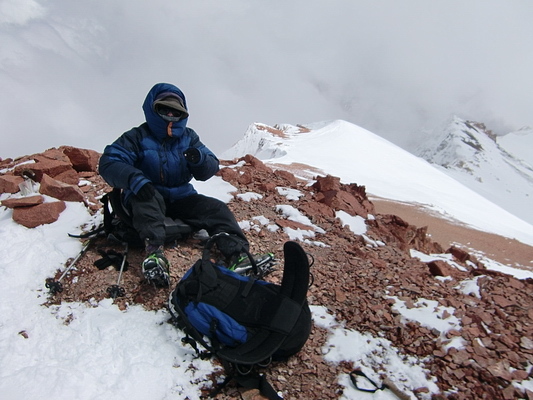 But he managed it to the place where we put on our crampons: 6255 meters high, for sure more than 20000 feet. Congratulation Franc! It started snowing heavily, when we were back at our tent. In addition some medium started in the night. Everything was white on the next morning. 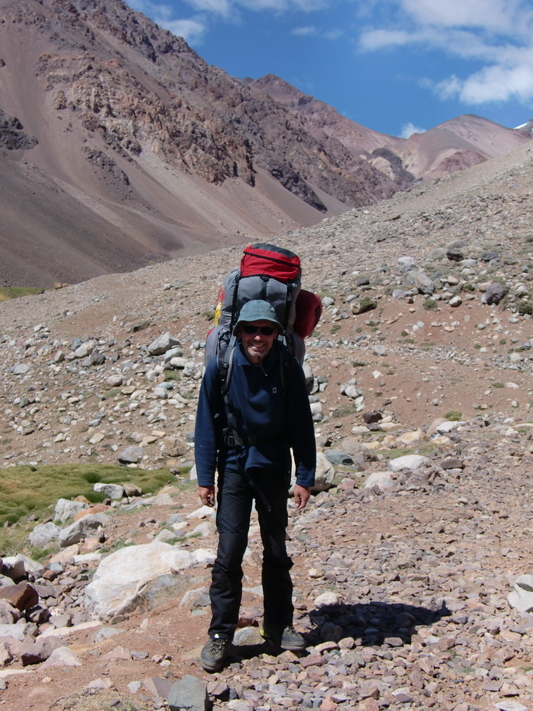 But soon the sun came and we hiked back to the base camp Guanaqutios: More than 2000 vertical meters with very heavy backpacks! Of course we did not go two times like on our way up. On the way down we had stunning views to the mountain called Cordon de las Pichereguas (Wild Boar Mountain). And we met two National Park Rangers, who claimed that the weather will become very ugly the next day. The shape of its glacier is like a wild boar. At Guanaquitos we had a celebration dinner with Franc. We ate an enormous amount of tin food like fish and liver pasties. If you are higher than 5000 meters usually you have no hunger. You have to force yourself to eat something. But the hunger comes back in lower altitudes, ... We lost some our pounds on Mercedario (and Cerro Plata), Alfred for sure more than 10kg in comparison to September 2010, when we had started this journey. The next morning was wonderful besides the statement of the two rangers. 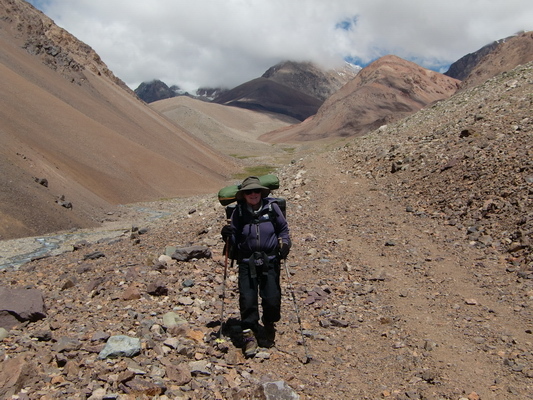 Only the huge backpacks striked us a little bit on our way to the Refugio Laguna Blanca. 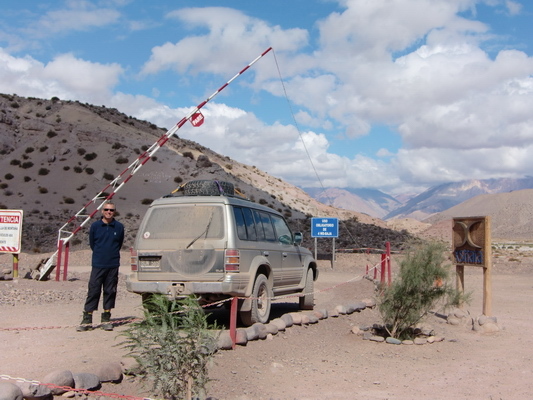 Soon we arrived at the Refugio Laguna Blanca and we were lucky: We could stop a mining vehicle and ask the driver to call Mauro to pick us up. In the late afternoon two boys came with a four wheel car, we hugged them and we were back in Barreal at 7:00PM. The first shower after 11 days! The first beer after 11 days! Sleeping on soft mats after 11 days. No wind, no snow, .... Unbelievable delicious! Suddenly we became famous in Barreal. A lot of people asked us about Mercedario. Two days after our return, three of the five German men came to our place at the camping place in the early morning. We were just taking showers. They couldn't believe that we had achieved the summit. But we had a very nice talk with them about Barreal. Barreal has a German quarter, so many Germans are living there. Besides that German quarter of Barrel had no water supply in the time we were on the mountain. This was due to the extreme bad weather this year, which is caused mainly by La Nina. La Nina moves the raining clouds from Bolivia far to the South. In Mendoza, we found a map of this region from Aoneker (see www.aoneker.com), but it is not very correct. 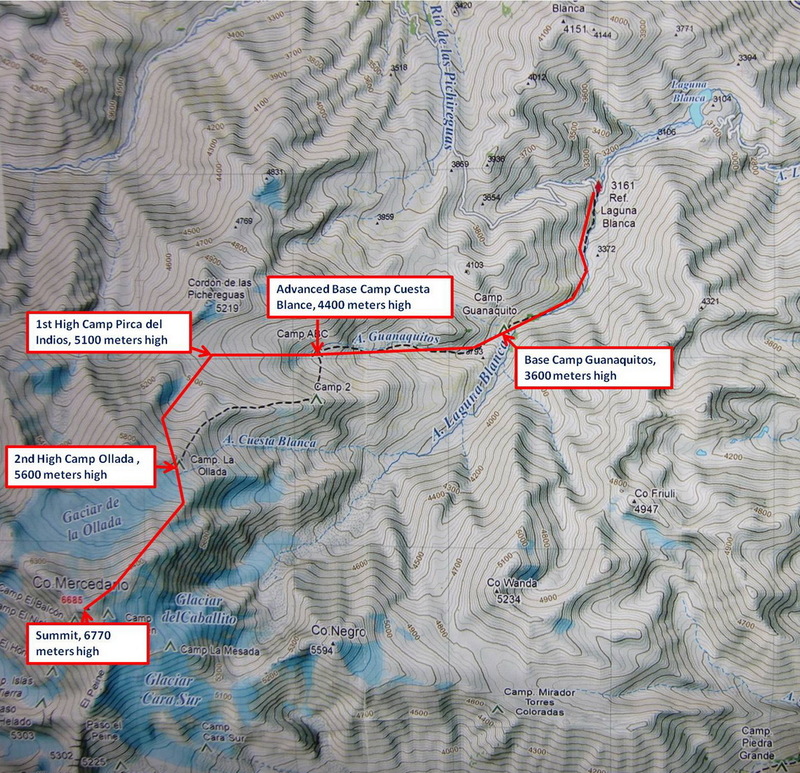 The way on the map goes to the ridge after the advanced base camp Cuesta Blanca. It is strongly recommended to follow the valley, there are good tracks. But you have to climb up a very steep slope. In case there is snow or ice, crampons are already mandatory at this point. 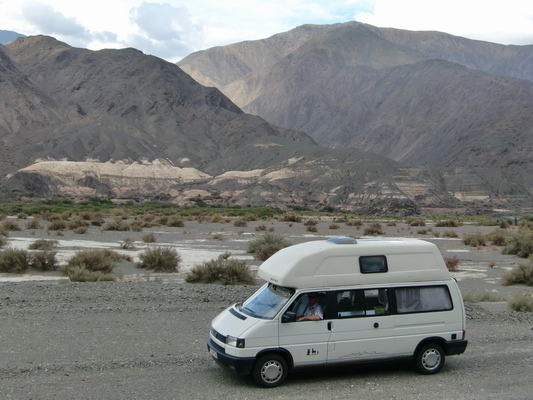 Our GPS tracks and waypoints are included in our GPS coordinates file of Argentina. Another issue is the height of this mountain: Official it is still 6770 meters, in some books 6700 meters and on the map above 6685 meters. 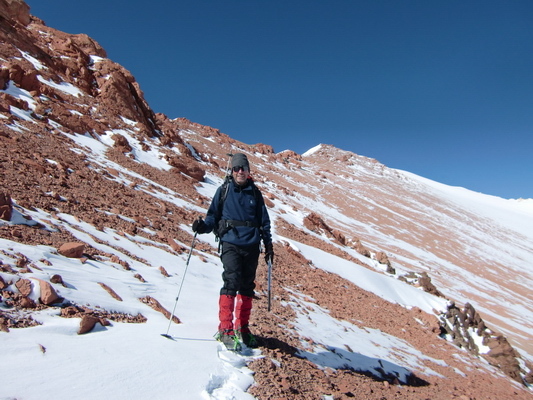 We measured with our Garmin 6738 meters, so we keep the official Argentine altitude of 6770 meters. Wow, da bleibt mir der Mund offen stehen. Respekt für so eine große Leistung! Hi Marion und Alfred, gratuliere Euch zu Eurem tollen Gipfelerfolg! Das ist schon ein super Abenteuer.